Square - How Did Square Grow So Quickly? By combining an elegant integrated payments system with a distinctive conversation-triggering piece of hardware, Square has disrupted the credit card payments establishment while making credit card processing more accessible to small businesses everywhere. In only a few short years (they were founded in 2009), Square has skyrocketed to a rumored valuation north of $3.25 billion dollars and 600 employees. A cursory look at their growth would suggest that they succeeded on the back of an unfair advantage - founder Jack Dorsey’s celebrity status, but a deeper dive reveals a powerful and sustainable growth engine driven through a systems-based approach to product design and eye-catching hardware that fueled interest from anyone who saw it. As with most fast growth products, the Square story starts with addressing a widespread need with an effective solution that completely reimagines small business payments. Before Square, it was illegal for non-registered merchants to accept credit card payments. Registering was a costly and difficult process that most small business owners couldn’t afford. These business owners struggled with the reality that while most people carried plastic instead of cash, the costs and complexity of credit card processing made it impractical to accept credit cards. Whether it was a local hot dog stand owner trying to increase profits, a college sorority fundraising for their organization, a philanthropic organization raising money for a good cause, or a politician raising money for their campaign, these groups often had no way of accepting credit card payments and relied solely on people carrying cash, which limited fundraising efforts and sales. There is not much public information available on the early traction of Square, but Jack Dorsey’s own personal profile (as Twitter cofounder) cannot be understated when it came to attracting early customers and investors. Dorsey created a list titled, “140 Reasons Why Square Will Fail”, which he distributed to potential investors of Square. The list included counterpoints to each objection, which informed investors that he was prepared for any possible obstacle the new startup may face. “140 Reasons Why Square Will Fail” also served as a clever strategy to acquire new interest. An elegant hardware/software solution that reimagined the payment processing space, similar to Apple’s iTunes/iPod approach to digital music. A business model that made payments accessible to small businesses who were previously shut out due to price and application process. Early tech excitement based on Dorsey’s public profile to drive initial awareness. Strategic partnerships that drove distribution and credibility fueling growth among their target customers. Square solves a real problem that relates to the number one priority of their target customers - making more money. And they make it very easy and low risk to get started. Once a user activates an account on squareup.com, the company automatically ships out a free card reader to them within 7-10 business days. Signing up is hassle free and quick with very little friction, which complements the company’s goal to gain as many new users as possible. An account with Square requires no contract, no monthly service fee, and doesn’t require a merchant service fee. As an added bonus, the credit card reader comes with a redemption code that allows new users to redeem $10, which is deposited into their bank account after registering the device. Compare this to the traditional payment processor model which required a detailed application, a phone call audit, and an expensive equipment purchase and/or lease. The Square phone app can be downloaded for free, turning any phone into a reader. The app is practical and easy-to-navigate. Even for non-tech savvy small business owners, Square is a breeze to use. Square customers who have a hard time using their iPhone have no problem taking a payment. Square delivers on the initial promise of solving small business credit card challenges and then goes on to wow customers with an integrated solution that includes beautiful reporting; much of the system solves needs the customer didn’t even know they had (after nailing the obvious problem). Square’s applications for small businesses make it easy to setup and configure point of sale systems on an iPad, can provide rich insights to help business owners make the most of business opportunities, and help build loyalty through two-way communication between the business app and consumers using Square. This integrated approach to payments goes far beyond just taking payments. Take business intelligence: Square gives small business owners access to data they never had before. What’s the most popular drink on the menu? The busiest day? And other data that lets small business act more like big business. Customer loyalty is another facet of the system. Square’s Wallet allows users to buy from merchants who accept Square without having to physically take anything out of their pockets to pay (the app has all of the customer’s credit card information saved). A customer can simply walk into the store, say his or her name, and the merchant can pull up his or her account profile and picture through geo-fencing technology. This technology detects when a customer is nearby a merchant-enabled store. The app also features the ability to find location nearby that accepts Square and provides customers with information such as contact info, menus, coupons, photos, and reviews of said merchants. All innovations around payments to remove friction and delight their customers—business owners and shoppers. Square spent the time and resources to make the hardware component of their solution interesting and even beautiful to the eye. Compared to other credit card terminals, it’s a work of art. This visible unique differentiator sparks conversations with customers. People naturally ask “Wow, what is that thing attached to our iPhone?” The experience of signing with your fingers and having the receipt mailed to you is convenient and amazing in itself. It’s completely unlike any other way to pay. The company keeps pushing forward with new technology such as the Square Register application which turns an iPad into a powerful, point-of-sale system. The app supports a traditional cash drawer and has the ability to print physical receipts with a compatible receipt printer—a smart evolution that acknowledges that cash still is an important part of small business commerce. With each innovation in hardware, the striking style and attention to detail and remarkable experience continues the conversation and creates more visibility for the business. For example, the new Square Stand spins completely around so that the customer signs on the same screen that the clerk uses. While efficient, it also creates a novel moment of surprise and delight as something completely unexpected from traditional purchase transactions. This delight creates goodwill, word of mouth, and customer satisfaction both for the store’s customer and Square’s. Business owners that are asked about Square are happy to rave about the product. It makes them look smart and hip to their customers and their peers. Square’s hardware design elevates the small business brand and provides delightful elements to their own customers’ experiences. 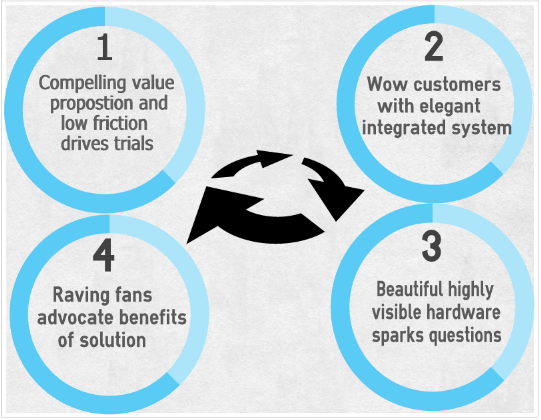 This positive word of mouth creates a flywheel of momentum for the business. And the more people that use and interact with the product, the more their ecosystem grows. More small business owners get the reader. Their customers download the Square app to make payments more seamlessly. 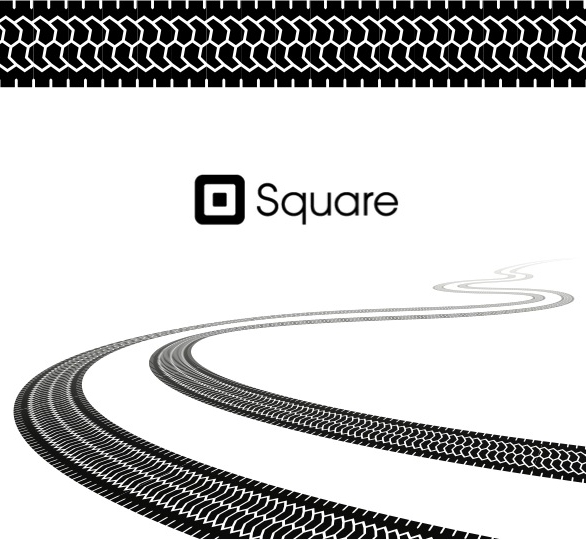 Those customers tell other business owners to install Square, and the beat goes on. As more people get added to the ecosystem their momentum gets stronger. New partnerships with companies like Starbucks will put Square in front of millions of new users, driving that flywheel ever faster. When compared to Intuit or PayPal, both who recently released credit card adapters for iPhones, the positive word of mouth and delightful experiences that generate it are powerful barriers for competition to overcome. This article contains a lot of data interpretation and speculation about the engine that is driving growth for Square. Speculation creates debate and dialog, which are two of the main goals for these analyses. Our hope is that this document will will spark a rich discussion where we can further break down the publicly available information to build the definitive understanding of Square’s unique growth engine. With your help, we’ll create the best case history of how Square grew, which will hopefully help future hardware entrepreneurs discover their own growth engine faster, leading to more successes for promising companies. We hope that this analysis will help new hardware startups identify some of the levers that they can test in their own growth strategies. By going beyond the obvious nature of Jack Dorsey’s fame, to a more complete understanding of their systems thinking and credibility building with their target audience, we hope that hardware entrepreneurs will find takeaways and new insights that will fuel their growth. In my opinion Square has grown for two reasons 1. They made it easier for small businesses to get payment processing set up, a solution to a real problem that did not exist before; and 2. The product required the users interacting with it to follow a new payment experience and made them aware that something like Square existed in the first place. These users then served as evangelists to potential merchants who were looking for a payment solution. In this sense it was much less about the visibility of the hardware of the actual merchant's experience, those may have mattered somewhat, but at least externally it looks like more traditional viral growth. One merchant installs it, hundreds or thousands of customers use it and become aware of it, some percentage of these guys talk about it to their friends/other merchants, and the cycle continues. It would be interesting if there was data about how merchant's actually found out about Square in the first place but if I had to guess, I would assume that it was driven by either their customers or friends who had experienced Square somewhere else telling them about it. Thanks Jamie. I agree that was probably an important factor. I would love to be able to survey their customers to find out the breakdown of how they discovered it. Me too!! As marketing manager of Tappr this would make my job soo much easier haha!! Guess we learn the best way we know how- Trial and error! I just realised this was published last year. Popping up today in my Twitter was quite timely. Thanks!! Glad you gained some insight @loztown, thanks for reading! Thanks for your feedback Jamie! I love how you break that down with the second point you made and is something I tried to capture in the "Raving fans advocate benefits of solution" section. Using Square became the "hip" thing to do and especially for young people - for instance being in a college fraternity/sorority it was highly useful. I remember seeing it for the first time and being naturally curious, Square was able to capture that curiosity by having an innovative product that fit a widespread need. My guess is that merchants just started to hear about it through the grapevine, they had some commercial campaigns but I do believe that word of mouth was the key factor. Two factors jump at me. 1. Historically speaking, complexity (thus upfront investment cost) in payment processing has been favored to defend from fraud/security. Square cleverly circumvented that by masking the complexity and spreading its cost to a pay-as-you-use model. 2. Square has added contextual (read monetizable) data it collects about its businesses AND their customers along with the transaction info that is feeding its 3+billion dollar valuation. Bravo to Jack. I recall a quote from him at a speech at Carnegie Mellon school - "don't just expect the unexpected, BE the unexpected". Thanks for sharing your well considered thoughts Mano. Love the quote! The pay-as-you-use model seemed to work perfectly - combined with them offering you $10 for free for using it, people did not feel obligated to use it due to the fact there is no fee to use the app. I believe that built trust within the consumer market because of this, making it easy for anyone to sign up. Thanks for your thoughts and I love that quote! Nice overview but I don't see any analysis on whether or not Square is actually making any money. The economics of payments means it's not safe to assume that is the case. One minor quibble, Intuit actually came to market with its dongle first, releasing its first version of GoPayment almost a year before Square hit the market. Hi James, I agree it's difficult to know how well Square is actually doing. For a private company, the best proxy of success may be the amount of venture capital that is pouring in. Fortunately for Square we also have rumored valuations north of $3 billion. The goal of this article was to determine how they've been growing, rather than validate the exact economics of the business. Also, I wasn't aware that Intuit's GoPayment was actually first. Now with PayPal and others in the space, I'll bet they are kicking themselves for not pursuing it more aggressively. I think the fact that Square wasn't first to market with the phone dongle underscores the value of the industrial design and visual nature of the product that sparked interest. Very much the white headphones effect of the iPod vs. every other commodity MP3 player. Everette, great article all around. What you guys are doing at growthhackers.com is so very valuable and I constantly find myself navigating around your site. I'm excited to read the next article you put together. Jack thank you for taking the time to read the article and giving such great feedback, happy to know that you're finding the site valuable! We'd love your feedback on this article. Everette did a great job of pulling together the information (even hounding people at Square who were pretty closed lipped). We had some pretty detailed discussions in the office and I think captured a lot of the important parts. But we would love to hear your ideas. Do you interpret this information differently? Are we missing a key piece of information? Why is breaking down growth of other companies important? Personally I find it the single most important source of inspiration for driving growth at my own companies. If I can tap into the creativity and iteration cycles of several other companies, I much more likely to come up with a breakthrough idea. If you don't have particular ideas about Square, let us know what company you would like us to cover next. You might even want to take the lead on breaking down a growth engine. We welcome your help. Another aspect that’s worth noting is that Square does direct mail. It’s something not a ton of digital companies are thinking about, but direct mail remains one of the best ways to reach SMBs. I remember getting a postcard mailed to me and thought it was really amazing. The postcard encouraged you to go to the Square website to get the dongle mailed to you also. Given that the CAC for acquiring SMBs is high – several hundred bucks in most cases – tactics like this actually make sense. Great nugget of information that wasn't included and many people haven't discussed. Square went the extra mile, whether it was sending direct mail or practically giving people $10 for using their "free" product. As much as we like to believe, not everyone is tech-savvy and many people still appreciate good old fashioned mail. It may seem "old school" but it actually makes companies stand out and help transcend others. Hey Andrew, Everette - is there anywhere I can read more about Square's direct mail strategy? It's such an unusual path to take in the tech industry I'd love to learn more about their approach. Thanks for sharing this extra bit of information. I haven't seen anything definitively written on Square's direct mail strategy, I only heard of it due to a small business owner I knew who first heard of Square by receiving something in the mail. I wish there was something that was written about it, could be absolutely useful. I'll see what I can dig up. It looks like they've used a company called Gunderson Direct: http://gundersondirect.com/ see their direct mail piece sample on the page. Fab.com has also done a ton of direct mail. I think direct mail works when you have very hard-to-reach targets online, have lots of cash to test many channels, and can laser target and track your direct mail efforts via unique URLs, sign-up codes, etc. Sounds like a super smart tactic. Do you think there's a way to get a picture (as an example) of one of Square's postcards that was delivered to you? Also driving their growth is money, lots of it. Square charges a significant premium over other CC processing options available to SMBs. 3.5% + $0.15 on manually entered transactions is madness if you're doing any sort of meaningful volume of business. You will end up paying Square $1,000's a year in transaction fees. Though, the ease of use and simplicity of their solution often justifies the premium. That side of Square is rarely talked about but its such an easy solution for so many that the premium seems well worth it. They also launched at an opportune moment: 2009, in the real credit crunch trough, with trust in finance brands associated with the status quo incredibly low. So in addition to the very real money benefit to vendors, there may also have been a particular appetite for new and innovative finance brands. Speculative but that's allowed I understand. Love the reverse psychology of "140 reasons why Square will fail"! I agree that the "140 reasons why Square will fail" was awesome. I recently heard this referred to as the "Premortem Analysis." I would definitely like to research more about the climate in 2009, that could have been a key factor. And yes I had never heard of the list before doing my research and surprisingly its not found in most articles about Square but such a great tactic. Great analysis Everette. I love the idea of analyzing the growth of other companies as it's a great way to draw inspiration and ideas. In marketing, we've always looked at the legends like Ogilvy for inspiration on how they communicated with audiences but the rules have changed. We're now living in a world that requires a different kind of thinking and that's exactly what you have here with the folks at Square. One thing I thought was simple yet brilliant was the idea of empowering their customers to share their stories. I can remember going to their site and always being met with stories from their real customers showing real results. It wasn't your Nikes or Starbucks either, it was corner stores and free-trade coffee shops. The results allowed Squares value proposition to be further communicated and put all doubters to rest. That's definitely what we want to do is inspire growth and ideas with analyzing these companies. Something marketers can come to as a guide for their own aspirations with whatever company they are with. That's something I didn't go into too much detail with in the article, a lot of their first users were small coffee shop owners, Square found a niche and excelled. While there are undoubtedly a lot of smart growth tactics in here, Square's growth also highlights the perils of going 100 MPH in the wrong direction. The company was a darling of the VC/tech industry given it's founder pedigree and the novel solution they developed (note: Intuit already had something before). Investors poured money into the company and boosted its valuation, but ultimately, Square grew but is still a company looking for a business model. They recently acquired Caviar ("Seamless for high end restaurants") and has toyed around with a lot of different businesses, but they've not figured it out. They grew fast but seemingly in the wrong direction and space. It's not to say that nothing can be learned from their growth tactics but having boat loads of VC money and a former Twitter founder makes this types of growth possible so not sure if the lessons are all that transferable. Square has come a long way. I enjoyed reading and learning more about them. These are great. Thank you for your insights, Jamie! As a bartender I have shown many bar owners that I have worked for how the system works and they loved it. A lot of bars around my town accept cash only and now starting to turn it around in town. I also have made my own business profile and bought a reader myself. So i can avoid the crazy costs to pull cash off my credit cards or my friends cards. Also if there is no atm around it has helped my friends. I also use it show business owners how easy it to use on my phone so they can see its simple to own a square setup. So I really think square did an excellent job they might be the next financial amazon. Also another point that they are missing is people who are in poverty stricken situations and may not have a bank account square makes it real simple for them to get money as well. They ask me to scan their card and then i give them the cash easy! So it has many more sectors then just small business.